A camera on the space shuttle Atlantis' external tank beamed this view of the spacecraft's heat shield to Earth during its Nov. 16, 2009 launch. WASHINGTON? Astronauts aboard NASA's space shuttle Atlantis inspected their spacecraft'ssensitive heat shield Tuesday for any signs of damage incurred during launch. Thecheckout is a now-standard precaution and NASA has no specific cause forconcern after Monday's smoothliftoff from Kennedy Space Center in Cape Canaveral, Fla., mission managerssaid. 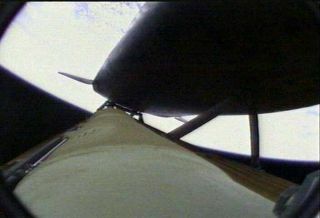 Commander Charlie Hobaugh and his six-astronaut crew used aninspection pole tipped with laser sensors and cameras to scan the orbiter'swing edges and nose cap for new dings or scratches. "Ifthere's been any impacts, things that have come off the tank or some sparedebris, or something has hit something, we can take a look at it with thesensor packages and try to determine if it's something that is kind of benignor something worth fixing with [a spacewalk]," said mission specialistLeland Melvin in a preflight interview. "And so we'll survey the portwing, the starboard wing and the nose cap and then make sure that everything'ssafe." The surveybegan early Tuesday and was expected to last about six hours, but the astronauts were ahead of schedule. They attached 50-foot (15-meter) inspection boom to the end of theshuttle's already 50-foot (15-meter) robotic arm and used its cameras and lasersensors to scan Atlantis'most sensitive areas. "It'sbeen very refined, well-scripted, developed over numerous missions, a procedurethat we go through now," Hobaugh said. "It's a long day. It's a lotof intensive arm ops obviously but what we do is we rotate our crew membersthrough to keep 'em fresh." Today'sinspection has been part of everyshuttle mission plan after the tragic Columbia accident in 2003, when apiece of insulating foam from that shuttle's external fuel tank broke off and struckthe orbiter's wing during launch, damaging the heat shield and leading to theloss of the spacecraft during re-entry. Seven astronauts were killed. Since then,NASA has devised new heat shield inspection and repair methods, as well asmodified shuttle fuel tanks to reduce the amount of foam debris during launch.NASA officials said Atlantis' launch looked relatively clean. BillGerstenmaier, NASA's associate administrator for space operations, said NASAobserved three small pieces of foam fall from Atlantis' fuel tank duringlaunch, but that they occurred too late in the liftoff to cause harm. "Theywere minor because they were after the time when they can really do damage tothe orbiter," Gerstenmaier said after Monday's launch. Nonetheless,engineers plan to pore over the data and video gathered during the launch to besure. Atlantis isbound for the InternationalSpace Station to deliver two massive carriers filled with spare equipmentfor the orbiting laboratory. The astronauts plan to spend about 11 days inspace, with three challenging spacewalks and complex robotic work scheduled.The two spacecraft are due to dock Wednesday at about 11:53 a.m. EST (1653GMT). The astronauts'day on Atlantis began at with a wake-up call at 4:28 a.m. EST (0928 GMT).Mission Control roused the crew with the song "I Can Only Imagine" byMercyMe, a tune selected for shuttle pilot Barry "Butch" Wilmore byhis wife Deanna to mark his first career spaceflight. "Whata very pleasant song to wake up to, thank you for playing that," Wilmoreradioed Mission Control. "Thanks to my wife for selecting it." SPACE.comis providing complete coverage of Atlantis' STS-129 mission to theInternational Space Station with Staff Writer Clara Moskowitz in Washington,D.C. and Managing Editor Tariq Malik in New York. Click here for shuttle missionupdates and a link to NASA TV.